[CONTINUED] The final act of the day would be the second demonstration of the Just in Time Skydivers. 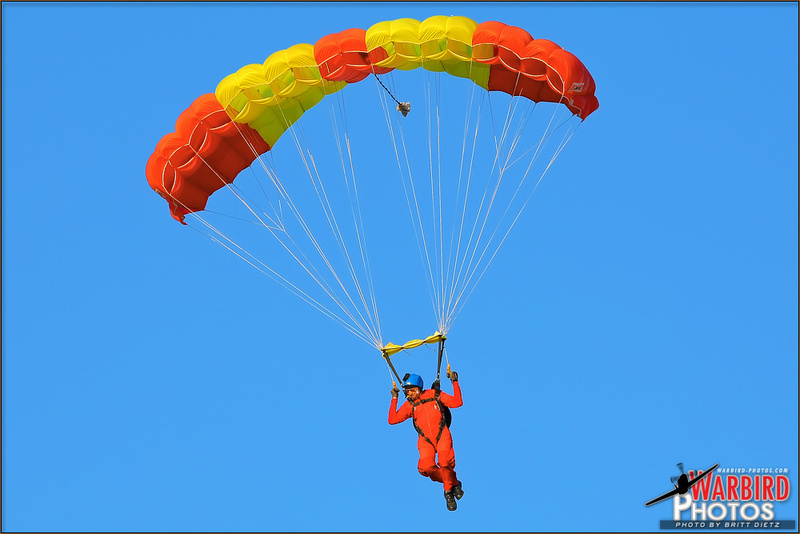 A member of the Just in Time Skydivers comes in for a controlled landing at the MCAS El Toro Great Park Airshow 2011. -Photo by Britt Dietz After their Beechcraft D18S had climbed up to an altitude so high you could almost not see them, each skydiver leaped out of the plane and headed at a very fast rate towards the earth below. They then demonstrated once again a formation free fall and the amazing flight handling and performing capabilities of their special ram-air parachutes each making precision and soft controlled running landings. As the last skydiver found his way down to solid ground, the end of the 2011 MCAS El Toro Airshow appeared unlike the quickly disappearing sun that was setting in the distance. The only aircraft to take to the air at this point were those wanting to head home rather than spend the evening on the El Toro base. It became a rush to quickly get the planes that wanted to leave out before the sun had completely set so the pilots would have ample light to get home. 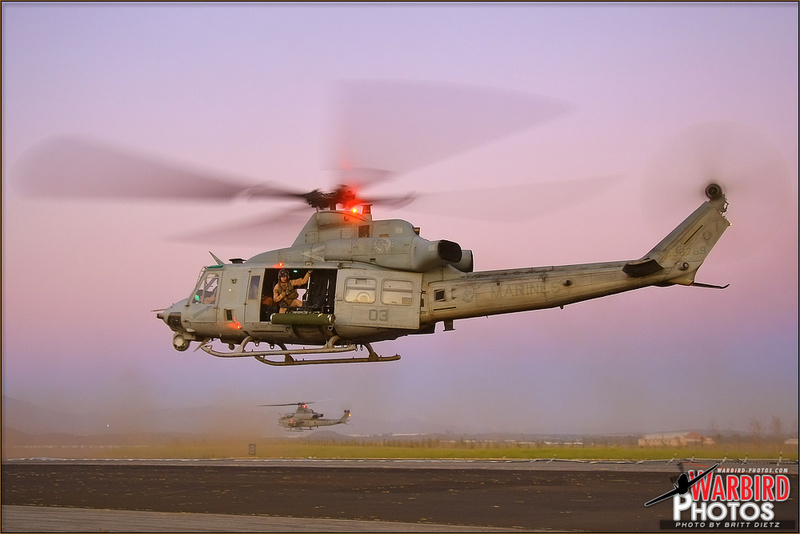 The last flights of the day were courtesy of the US Marines from HMLA-367 in their Bell AH-1Z Viper and Bell UH-1Y Venom to head back to Camp Pendleton. The crowds were pushed back slowly towards the main Great Park venue and out of the Runway section as the static aircraft on display all came to life and headed out towards the distant runways. A US Marine UH-1Y Venom lifts off the ground as an AH-1Z Viper departs in the distance at the 2011 El Toro Airshow. -Photo by Britt Dietz For the select very few who were allowed to stay in the now 'hot ramp' area, the highlight of the evening was the spectacular and rather windy departure of the AH-1Z Viper and UH-1Y Venom nearly knocking over those who stood near as their rotor wash with nearly 100mph downdraft winds made the ground shake. The Viper lifted off first after a length preflight check and warm up, gracefully lifting the nose high into the air and rising into the sky, pulling away from the static display area and heading out towards the middle of the base. The Venom didn't waste anytime following, but instead of a graceful nose raise, the Venom fire up full blast and lifted into the air sending every rock and lose particle flying in all directions. 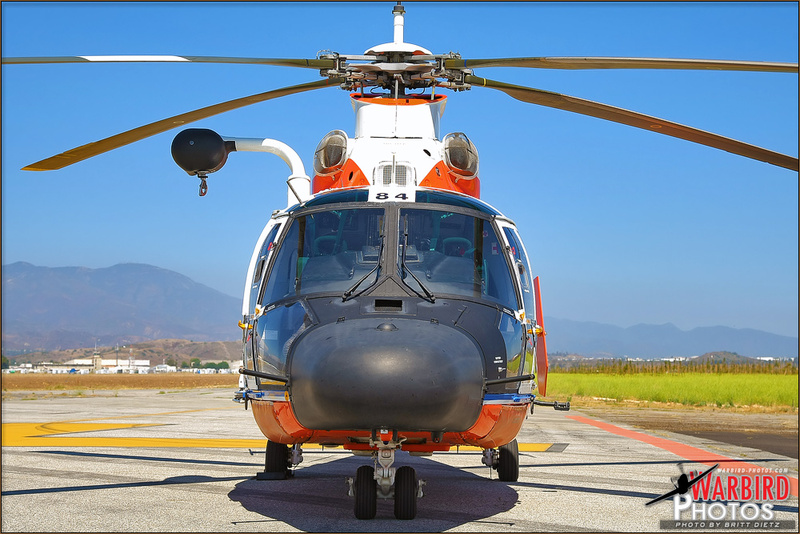 After both sleek helicopters were airborne and heading to the distance, they picked up speed and banked around coming back over the Great Park with loud roars announcing their departure from MCAS El Toro. As their sound echoed in the distance growing fainter, the air would soon quiet down and the only sound left for the event would be the various bands playing throughout the Great Park venue and the loud explosions of the great firework show that would end out the evening. With the bulk of the crowd staying through the large firework show that was quite impressive for a county that has a large theme park that does high production nightly firework shows, the aftermath of the event could only mean one thing: the typical Airshow traffic jam leaving the base. The sun sets in the distant Southern California sky as the end of the MCAS El Toro 2011 draws to a close. -Photo by Britt Dietz It could be said that the traffic jam leaving El Toro along could be the key feature that would elevate this even to full Airshow status, having a massive Airshow sized line of cars trying to leave the base with only two exits. Those who remember the old MCAS El Toro Airshows remarked on how it reminded them just how it used to be back in the days when the original show had ended and the line of cars meant a traffic jam that could last an hour to escape. Eventually, the lines started to get shorter and shorter until the path to leave the base was empty, and with that the MCAS El Toro / Great Park Airshow 2011 had come officially to an end. 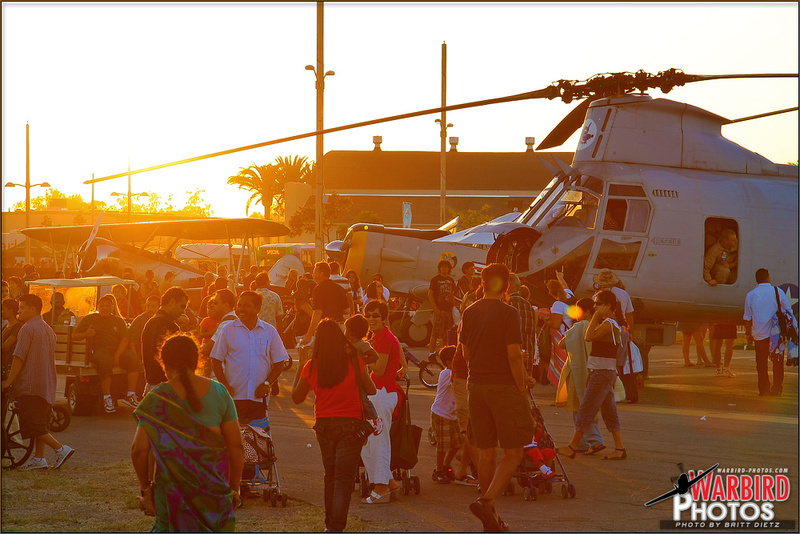 With the success and growth in the 2010 Airshow, it looks like there's a lot in store for the future of MCAS El Toro. Here's looking forward to a much anticipated even BIGGER Airshow next year! PARKING: Free, and pretty easy if you get there early. Otherwise lines can get long with only two entrances to the base. Once inside, though, its quick parking in the massive parking areas on the former tarmacs of the base. Shuttle service provided to the airshow area, or you can walk. WEATHER: Very HOT. Drink water and bring sunscreen. DISPLAYS: Small assortment of warbirds from the military museum along with some fly-in warbirds from different airports. US Marines sent out several helicopters. FOOD: Several food vendors and local groups, along with the Great Park's own portable food stations. VENDORS: A couple of local groups and activities for kids. OVERALL: A great growing show that shows a lot of promise if the current rend continues. 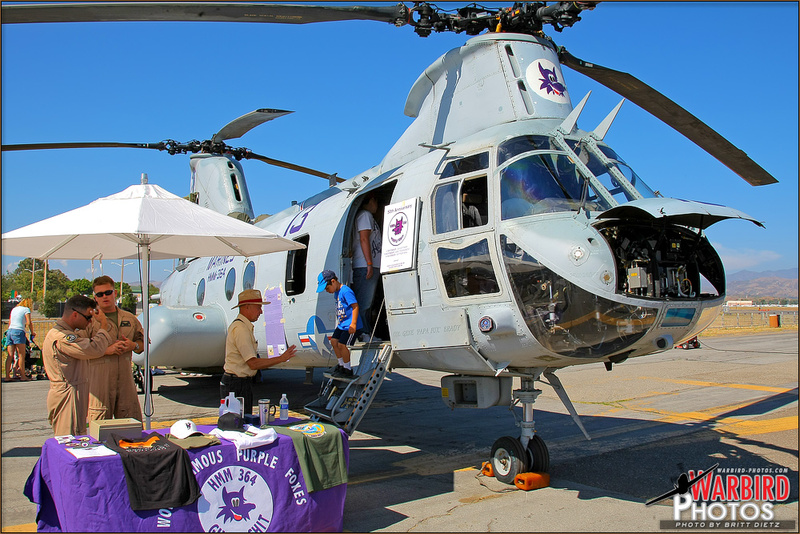 Definitely worth seeing if youre an aviation fan, want to relive the MCAS El Toro Airshow days, or if you just want to hang out somewhere with a lot of activities. 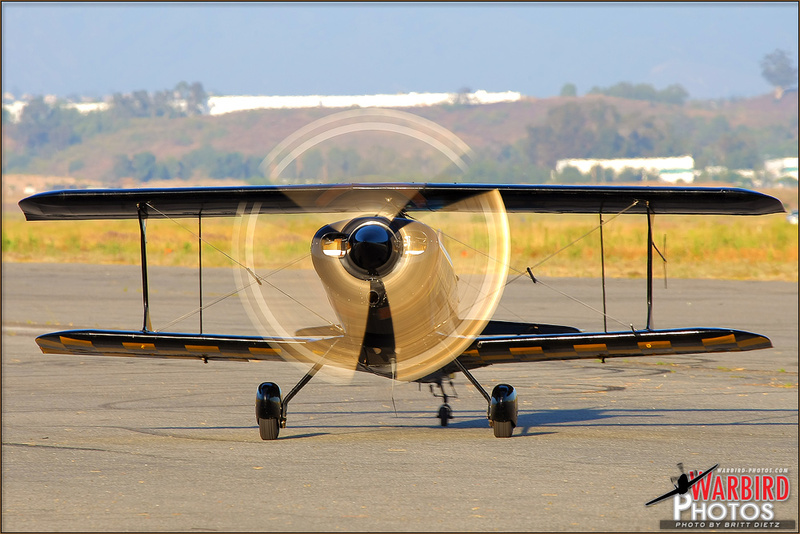 MCAS El Toro Airshow - Great Park Celebration held on July 9th, 2011 here on Warbird Photos.